I love cream cheese! It’s rich and creamy, and tastes great on anything from bagels to crackers. It’s a fabulous addition to desserts and appetizers, and you find it in many savory dishes that are served for the holidays. By making it at home with yogurt, you can be sure that your cream cheese is full of only healthy ingredients and has the added advantage of probiotics. It’s not hard to make, and tastes better than store-bought cheese! You can use yogurt cream cheese in your holiday recipes, mix in chives and garlic and spread it on a bagel, or serve it topped with something savory or sweet as an appetizer. Homemade cream cheese is even pretty enough to earn a spot on the cheese tray next Saga blue and aged cheddar! I made my yogurt cream cheese using a batch of homemade, raw milk yogurt. I found a lot of tutorials online on how to make cream cheese, and ended up using the technique outlined in this very funny Youtube video by Chef John at Foodwishes. First, set a strainer on a deep plate and lay out three layers of cheese cloth in a strainer. Add your yogurt. The whey will drip through the cheesecloth into the plate or bowl. Tie the cloth around the yogurt securely with kitchen twine, then tie the twine to the handle of a wooden spoon. Place the cheese-ball (it kind of looks like a cocoon, doesn’t it?) in a pitcher or jar and put the whole thing in your fridge for 24 hours. The liquid that drips out of your yogurt is whey, and it’s full of healthy probiotics. Save this to culture lactofermented foods or as a substitute for buttermilk, there are many healthy uses for whey! Now it’s time to mold your cream cheese. 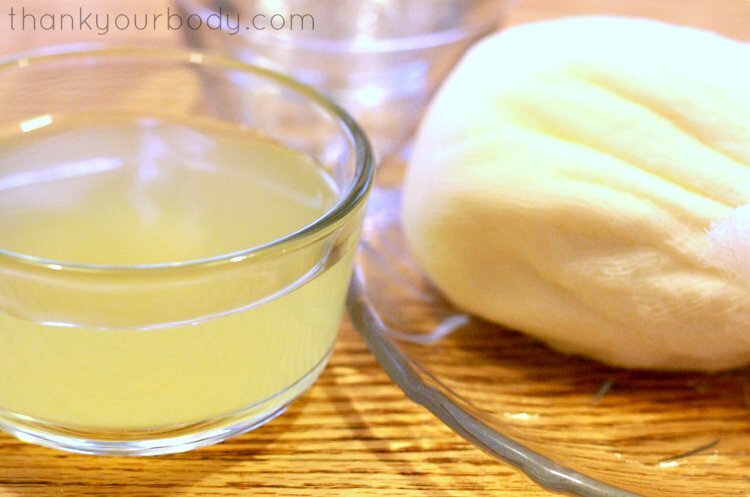 Place several layers of cheesecloth in a small container of your choice. Open your cheese-ball and transfer the thickened yogurt cheese into the container, pressing down firmly. Fold the cloth over the top of the cheese, and then place some plastic wrap over the cloth. Cut a circle out of cardboard, so that it fits on top of your container. Use something heavy (I used a canning jar full of water) to weigh down the cheese, and find a safe place for it in the fridge. After 2 or 3 days, the cheese can be un-molded and served. Yum! Rich, creamy cheese…with no additives or preservatives! Serve it plain, or top it with roasted garlic and chives, or drizzle raw honey over it and sprinkle it with crushed pistachios (as seen in the video). Served with crisp apple slices, it makes a fun and healthy dessert! Cream cheese is so rich and wonderful I just can't get enough. This homemade yogurt cream cheese is a guilt free recipe you'll make time and time again. Layer 3 pieces of cheesecloth in a strainer. Set the strainer in a deep plate, and spoon your yogurt onto the cloth. The plate will catch the liquid as it starts to drip out. Fold the cloth around the cheese, and tightly tie it at the top to form a ball. Tie this ball to a long spoon, and hang it in a large jar, pitcher or deep bowl. Place the whole thing in your fridge, and leave it for 24 hours. Line a small container of your choice with several layers of cheesecloth. Press the cheese into the container, folding the top of the cloth over the cheese. Place plastic wrap on top of the cloth, then cut a circle of cardboard to rest on top of the cheese. Place a heavy object (I use a canning jar filled with water) on top of the cardboard, and return to the fridge for 2-3 days. Carefully un-mold the cheese, turning it onto a serving plate and removing the cloth. Serve plain, or with a topping (like roasted garlic and chives, or drizzle with honey and sprinkle with crushed pistachios and serve with apples as a dessert). What’s your favorite use for cream cheese?